The following article was written by Wayne Bowman and published in the Trinidad Express Newpaper, Apr 23, 2012. The Department of Creative and Festival Arts at the University of the West Indies, St Augustine, on Friday hosted the second edition of its annual TH?NK conference at the Faculty of Engineering. The conference series examines various facets of local culture, festival and performance arts and explores how can they be effectively employed towards the social, aesthetic and financial benefits of the people. Conceptualised by cultural researcher Dr Suzanne Burke, TH?NK also dissects Government policy on culture, identifying areas where there may be shortfalls and things that may have been overlooked. Through panel discussions and lecture presentations, ideas are compiled and documented. The papers are made available for researchers and those responsible for formulating policy on the local entertainment industry, culture and festival arts. At the opening session of this year’s TH?NK, the keynote address, titled “The Role of Culture in Caribbean Development”, was presented by Jamaica’s Director of Culture, Sydney Bartley, who is hailed as a guru of culture throughout the Caribbean and beyond. Bartley noted that, throughout the Caribbean, influences from Europe and America overpower the cultures of the islands, overshadowing the identities of the peoples. In one of his examples of this, Bartley quoted Bob Marley’s “No Woman No Cry” to show how the people have been changed by invasive foreign influences. “I remember when we used to sit in a government yard in Trench Town. And then Georgie would make the fire light, log wood burning through the night. Then we would cook cornmeal porridge of which I’ll share with you,” sang Bartley, who was joined by some in the audience. Bartley then explained that Marley’s lyrics referenced what life was like in the Caribbean then when men, elders and youth alike used to sit together and reason. He said women did not cry when men sat and talked, conversed, worked things out instead of shooting one another, even in hard times. When men sit together and observe women don’t cry, Bartley said. Bartley also likened the lyric on sharing the cornmeal porridge to the days when neighbours shared a cup of sugar and other things with one another. Society now teaches people to lock into themselves and not interact with their neighbours, he said. Bartley said community living was how the slaves brought here survived mentally because, after the entire day in the fields, at night they ate together in the barrack yard and shared stories, drummed and danced. Bartley said the two things Caribbean people excel the most in, sport and culture, are designated as extracurricular activities. He said this is the biggest failure of the Caribbean education system and even went on to knock the university system, saying it continues to put the proverbial cart before the horse where sport and the arts are concerned. Bartley said if an artiste such as Machel Montano were to decide to pursue university studies here in the Caribbean now he would have to start at the beginning in spite of his years of success and achievements. The right thing to do, Bartley said, would be to allow Montano credits for what he has accomplished throughout the years he has been doing his music. Bartley said the system has to be changed to serve the people of the Caribbean specifically so we can enjoy the maximum benefits of what we possess. Bartley said nothing cultural has ever come out of universities because it’s the grassroots people who have created their cultural identities. Therefore, said Bartley, any government-formulated cultural policy and cultural education plan must consider the cultural identity of the people. Bartley said how the people through the ages have healed themselves using herbs and the things of nature, to how they made use of limited financial and other resources, has shaped the culture and seen them survive. An interesting moment in Bartley’s speech was his invitation to the participants to join him in singing Bob Marley’s “Redemption Song”, which everyone did heartedly. This Bartley did to drive home the point that it is by remembering who we are as a united Caribbean people that will make us prosper. Bartley also in his presentation celebrated the music of the Mighty Sparrow and David Rudder as artistes who, like Marley, have helped the Caribbean people sing their own songs despite being bombarded by foreign cultures. 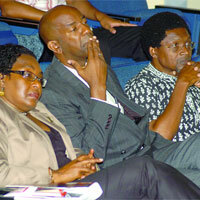 For the original report: Rethinking C’bean culture | Trinidad Express Newspaper | Featured News. The following interview, initially published in New America Media and reproduced in Repeating Islands, presents some insights into the popular music culture of Cuba. 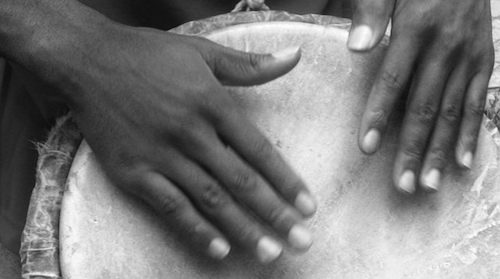 From charanga to son to timba, Cuba has long been a country world-renowned for its distinct musical styles and traditions. Nevertheless, people inside the United States – even the most ardent music lovers — aren’t likely to become aware of the newest Cuban artists or to hear the latest musical trends, short of paying an actual visit to the island. Greg Landau is a producer, musician and educator from the Bay Area who’s traveled to Cuba more than 30 times. New America Media editor Jacob Simas sat down with Landau in his Alameda recording studio, where they spoke about Cuban music — where it’s been, where it is now, and what it can tell us about the psychology of the people and the state of affairs on the island today. To hear an audio version of this interview with music excerpts, click here. Jacob Simas: You recently came back from Cuba with a stack of CD’s — new music by Cuban artists that are unavailable commercially here in the United States. What struck you about the music that is perhaps different from where Cuban music has been in the past? Greg Landau: Well, Cuba has a long history of music and a really rich tradition that combines a lot of different elements, and what I’ve seen in every trip is how the music evolves, and how each generation takes elements that they’ve inherited and makes them into a new blend. So the process continues, and a lot of [today’s] groups are innovating, using [traditional] elements, but also the things they hear from outside the country. So you hear reggaeton, hip-hop, cumbia, roots reggae and heavy metal — all these things that are popular outside of Cuba, being interpreted by Cubans in their own way. But what’s amazing is the level of virtuosity. Because people are able to study and gain that virtuosity because they’re playing all the time, they have time to rehearse, and they’re getting schooled in music schools. JS: Are young people and elders today in Cuba listening to completely different types of music, or is there a shared appreciation? GL: The music really crosses generations more than it does here, because first, dancing is common to everybody. Everybody dances [to] music that comes out on the radio, and there’s a mix of old and new. Young people are forced to learn the traditional dance styles, and they know them. They know how to do the danzon; they know the rumba. They’re taught this in school. There’s education. So it does cross generations a lot. Even most of the popular groups — a lot of them have been around for a long time — are constantly evolving. Still probably the number one group in Cuba is Los Van Van, which would translate into English as “The Go Go’s.” They’re still the number one group. They’ve changed singers and new generations of musicians have come through, but the essence of it is that they take Cuban music and combine it with contemporary elements, especially American funk, which is what’s kind of popular right now. JS: People in the U.S. really have no easy way to hear these tunes. Do you see that changing? Do you see the music industry opening up a little bit or new avenues being created for Cuban music to be heard by people over here? JS: Can you give an example? GL: Well, a lot of the songs are making reference to the Afro-Cuban religions, and the fall of the Soviet Union that has caused a vacuum in Cuba, where the ideological foundation, the spiritual foundation of the society based on these communist principles, is gone. People have to fill in the void and figure out or find a way to explain why they’re here. What are we doing while we’re here on this planet? What’s our goal? What are we supposed to accomplish? How do we treat each other? Kind of the whole basis is gone. So we can see that much of the Afro-Cuban religions come in to fill in this gap; that people start reaching back in their history and their tradition to find that social glue. A lot of the music talks about this. There are many young people making references to the Afro-Cuban religions, to this spirituality, and to this explanation that it provides. And people [ask], how did Cuba survive this long? People thought that with the fall of the Berlin wall it would be over, but it wasn’t. So people have found ways to kind of pull it together, and this is a message in a lot of the music… this new spiritual foundation that’s kind of holding things together. JS: Music is also often a platform for political messaging. Is there a similar platform for musicians in Cuba to speak about politics, or not? GL: Well yeah. A lot of political debate and a lot of political discussion in Cuba goes on through the arts. People look at Cuban film. It’s very critical of government policies, many of the popular Cuban films, and it sort of opens up a gap to allow people to discuss these things that maybe can’t be discussed in other forums. Music, too. Starting with the Nueva Trova movement of the early ‘60s — it really begins in 1967 – that opens up this musical poetry, a musical poetry that kind of examines and gives people tools for understanding what’s going on around them. There’ve been maybe eight generations since the Nueva Trova movement, of musicians that have taken this up — not necessarily playing dance music, but playing music for people to listen to, to make critiques of society, to open up dialogues. So we see, going back to Silvio Rodriguez and Pablo Milanes, who are still active; Noel Nicola, Sara Gonzalez, and then the next generation that incorporates elements of rock, and then we see elements of jazz; and so they’re experimenting with not just the content but the form, and pushing the envelopes of pop music. JS: How does the music industry work in Cuba? GL: Well first off, I wouldn’t really describe it as an “industry.” In Cuba, many of the groups are on salary, which really creates a new dynamic. First, in a capitalist society, groups rise and fall based on their popularity and their money making capacity, where in Cuba, this is very different. Some of the groups are sustained because they’re on salary, they survive maybe even when they’re not so popular but they’re still going… because these are traditions that are preserved. So for instance, La Orquesta Revé… Elio Revé was popular in the 1960?s, and he had a big band that played changui (a traditional Afro-Cuban musical style) from Guantanamo, and made all these different variations on it. There was changui with violins and heavy drumming, and they went through phases of being popular and not popular. And now his son has taken over the group and continued it, and they’ve incorporated new elements. So the groups are kind of like institutions that are maintained, like a preservation hall. These forms of popular music are seen as important, and these elements in Cuban culture are maintained way past when they probably would be in a capitalist society. JS: So, the Cuban state is subsidizing its artists. How does that impact everyday Cubans? GL: [Cuban musicians] can go play for free in the town squares all over Cuba. Every weekend, all over Cuba, there are huge concerts in every town. So what do you do on a Saturday night? Do you go to a club? No, you go to the town square, with thousands of other people, for free, and listen to music and dance and party. This goes on very frequently. There are frequent festivals and these groups tour all over Cuba, mainly playing for free in town squares, in schools, in hospitals, army bases, farms… wherever. The idea [behind government subsidized musicians] was that one of the rights of being a citizen is the right to culture. This youtube video shows La Orquesta Revé in performance and the joyous response of the audience as they sing and dance to the infectious music. Also: Cuban Music Still Thriving, Still Unheard in U.S. « Repeating Islands. The following feature on Jamaican-born jazz legend, Andy Hamilton, was written by Steve Bradley and published in the Birmingham Mail. So says Birmingham historian Prof Carl Chinn about jazz saxophonist Andy Hamilton – still going strong at 94. Hamilton, who arrived in Britain in the first wave of West Indian immigrants in 1949, came with a real pedigree as musical director on Hollywood legend Errol Flynn’s yacht Zaca. But he has experienced some crushing ‘downs’ sprinkled with a few significant career ‘ups’. Despite earning an MBE in 2008 for services to music and young people in Birmingham, he has endured racism, sometimes accompanied with violence, and had to battle to win regular gigs for himself and his band The Blue Notes. Born in 1918 in Port Maria, Jamaica, Hamilton heard early US radio broadcasts and was exposed to the music of the Jazz Age in the 1920s. Displaying a rare talent, he came to the attention of heartthrob Flynn, who owned the Titchfield Hotel in Jamaica’s Port Antonio. “I think it was 1946 and I was playing there with my band on the terrace,” Hamilton recalled. “Flynn had just come back from Hollywood and danced real close with his wife for a couple of numbers. “The next morning a car and chauffeur arrived outside my house and the man said ‘Robin Hood wants to see you’. “We went down to the harbour where he was on Zaca. Flynn said he liked my music and offered me a regular spot at his hotel. “The Titchfield was the best hotel in Port Antonio so it was a good day for me and my band. “He sure liked a good time. He had bought a small island called Navy Island and he used to have big parties there. “One time he invited the whole crew of an American Navy cruiser, my band would play by the beach and there was a lot of dancing and people having a good time. “People like Noel Coward and Ian Fleming lived close by and there would be lots of late-night parties. Docking at Southampton, Hamilton took a train to London, then travelled to Manchester, but in little over a week chose Birmingham. Hamilton made his base at a house in Trafalgar Road, Moseley, owned by Prof Chinn’s aunt Violet and Jamaican uncle Johnny Brown. “It was real tough at times, some places would not let us in and sometimes there was trouble but most people were friendly. “I remember going to a jazz club with my sax and got invited up on stage and did a couple of numbers which went down real well. “I was really happy but when I went back the next week they just ignored me. Gigs followed at venues like the Tower Ballroom, Rum Runner, Chaplins, Cedar Club, plus nightspots in Coventry and Wolverhampton. But in the 1950s he was attacked by fascists at a gig he had organised, losing his front teeth. Hamilton, who married a white woman, Mary, said: “I had started a night and it had got popular, then one night a group of young guys came in and you could see they were looking for trouble. “In a break one of them walked onto the stage and picked up my sax. “I went up to him, real cool, and asked him to give it back but he was drunk and punched me in the face. “The police came, I was arrested and had to go to court. After decades of performing, Hamilton’s big break came when an article by renowned jazz journalist Val Wilmer earned him a slot at the Soho Jazz Festival in London. From there he won a record contract with the World Circuit label to make his first-ever recording, aged 72. Hamilton called the 1991 album Silvershine, named after a long-forgotten tune he had written for Flynn, and it featured Simply Red’s Mick Hucknall and US tenor sax giant David Murray. Work was easier to come by after that, at least for a while, with shows in St Lucia, at the South African Jazz Festival, and WOMAD festivals across Europe. He has since won an honorary master of arts degree from Birmingham University and a Millennium Fellowship award for his work in community education, to which he recently added a fellowship of Birmingham Conservatoire. But although he holds down regular gigs at Bearwood Corks Club and in the Symphony Hall bar, he had to battle for years to get a slot at the Birmingham Jazz Festival. And his band, which has featured two of his sons, Graeme and Mark on trumpet and saxophone respectively, is made to feel it still has something to prove. Andy said: “There have been some tough times with a big family and with a six or seven-piece band to pay and equipment to buy. For the original post: The amazing life of Brum jazzman Andy Hamilton, who played for Errol Flynn, Noel Coward and Ian Fleming and has just turned 94 – Top Stories – News – Birmingham Mail. In the following article Trinidad Express columnist Wayne Bowman reports of the recently concluded 2012 Jazz Artists on the Greens. The sight of patrons wining, jumping and waving bandanas gave the impression they were at a Carnival fete when they were, in fact, enjoying the music of Clifford Charles and Friends at the 2012 Jazz Artists on the Greens (JAOTG). The tenth edition of the concert took place on March 24 at the WASA Grounds, St Joseph, and featured several local jazz acts alongside artistes from abroad. The event was introduced in 2003 by Production One Ltd, which comprises several jazz enthusiasts who believed there was the need for a platform for homegrown jazz musicians. Back to the rag-waving patrons and Charles, who is an accomplished guitarist, known for interpreting soca hits in the language of jazz in a most unique manner. Charles took “Bacchanalist” by Kerwin Dubios and gave it an alternative identity that was much appreciated by the patrons. Some abandoned their seats and came nearer the stage to dance as Charles and his fellow musicians jammed. Charles and company opened their set with “Strolling”, an original song from Charles’ debut CD collection from a few years back. The first people to leave their seats and approach the stage did so as the band began to play “That Girl” by Stevie Wonder. The patrons danced happily as Charles and the other musicians, David Richards (drums), Sean Friday (bass), Rodney Harris (keyboards) and Deryck Cadogan (keyboards), played around with the song’s melodic and rhythmic structure, improvising and delivering exciting solos. We should note here that JAOTG is a laid-back event that affords patrons the opportunity to either sit in the chairs provided or spread blankets on the ground. There is always a variety of food available, but some people walk with small coolers with wine and other drinks, along with light snacks such as cheeses and other finger foods to nibble as they take in the show. Another element of JAOTG is the socialising among patrons and the musicians being featured, as well as those who come out to support their peers. So as Charles continued his impressive performance, the band then did a few songs from his new CD collection, Songs From Deep Within. They performed the title track, followed by “Bounce”, punctuating that with the jazz classic “Take Five”. Near the end of the set, they played a jazz interpretation of “Dance With You” by Machel Montano, which is the song that initiated the abandoning of seats, and “Bacchanalist” kept them coming. The act that really had the audience mesmerised was Michele Henderson, the songbird from Dominica, who has been a Goodwill Ambassador for her island since 2004. Accompanied by Michael “Ming” Low Chew Tung, along with Dean Williams (guitar), Kevon La Fleur (bass), Modupe Onilu (percussion) and Richard Joseph (drums), Henderson had the audience cheering at intervals throughout her performance. She opened with “Agua De Beber”, in which Onilu and Williams traded solos that impressed even Henderson, who grooved to the music just as much as the audience. Actually, throughout her set, Henderson’s passion for music was clearly evident as she imbibed everything around her on the stage. This, of course, made for a fantastic performance that we are sure the patrons will speak of for some time to come. In the song “Misty”, Henderson played a captivating flute solo as the intro, with Low Chew Tung adding in a smooth solo on keyboard. Williams delivered a lively guitar solo when Henderson sang “My Favourite Things”, popularised in the classic movie Sound Of Music. Henderson had people dancing when she opened “Waiting In Vain” with another intoxicating flute solo, then giving way for Williams to again work his magic on the guitar. As Henderson exited the stage, the audience demanded more, and they were treated to a few additional minutes as she brought the house down with “Do I Do”. Her session also included “Fow Daw Leve”, “Pani Pawol”, “500 Miles High”, “I Am Changing”, “Spain” and “Armando’s Rhumba”. JAOTG 10 also featured performances by pannist Annise Hadeed, who was supported by Theron Shaw (guitar), Douglas Reddon (bass) and Richard Bailey (drums). Opening was Carlton “Zanda” Alexander and the Coalpot Band and multi-faceted vocalist Llettesha Sylvester. 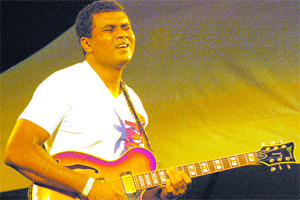 For the original post: Joyful Jazz | Trinidad Express Newspaper | Sunday Mix.